Pin it! How to do tree pose. I'm bringin' it back to basics today with a little how to for tree pose. It's one of those poses that has a hundred different variations which I love because it means that it can never get boring. Shown here is the standard tree pose, and if you feel strong with that, try lifting the hands overhead and pressing them together. If you feel confident there, close your eyes and see what happens. You could also take the arms out to the right and then out to the left, just playing with leaning side to side while remaining very strong and stable in the standing leg. See what I mean? The options are endless. 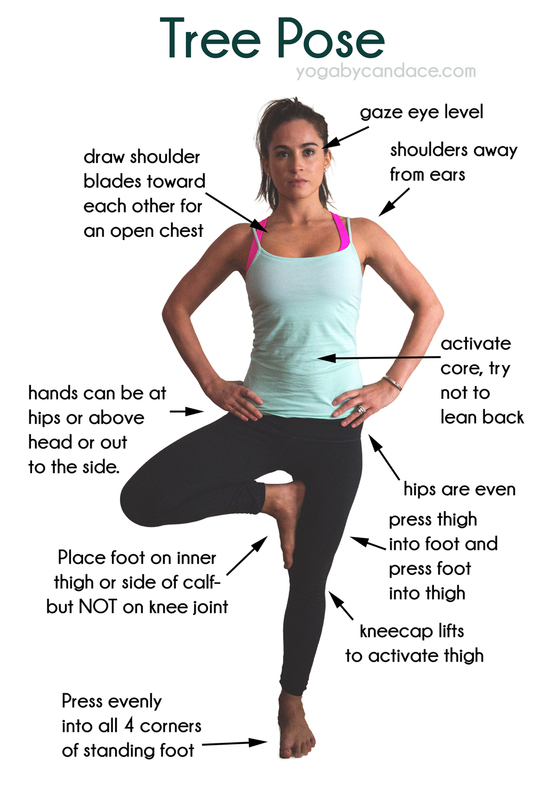 Balancing poses are so beneficial because they help strengthen the little tiny muscles in the feet that aren't used as much because we stuff them into tight socks and shoes every day. For this reason, balancing poses like tree can be difficult for people. If you find yourself falling over all the time, try taking the pose off the mat and directly onto the floor. Sometimes a yoga mat is too thick and messes with our sense of balance. PS- Tips for balancing better in yoga, and a balancing yoga sequence video you can try.